Inhabiting the rich and peculiar realm of Samuel Beckett’s trilogy novel Molloy, Malone Dies, and The Unnamable, Arcane Collective presents excerpts of its latest two-part production, Return to Absence and Ebb. 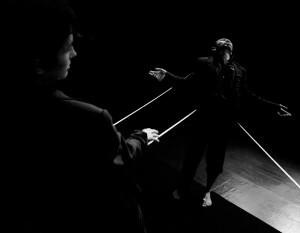 Constructing a fluent language of movement as abstract and absurd as Beckett’s words, the dance weaves a non-linear tale of decrepit persistence and playful futility of life at the end of its tether. The dance weaves a tale of decrepit persistence that is nostalgic, melancholic, and touchingly humorous. Premieres at New York Live Arts in April 14-16 2016. This entry was posted in Uncategorized by morleigh. Bookmark the permalink.